Last Wednesday, I was honored to attend Secretary Hillary Clinton’s State Department Eid al-Fitr celebration for the second time. It was wonderful to see old friends and colleagues! I was especially excited to meet G. Willow Wilson, a wonderful author and the lady behind some awesome comics–I’ve known her online for many years, but this was our first time touching base offline! I was also able to meet a lot of my fellow contributors from I Speak for Myself that I haven’t met in person before. I was repeatedly struck by what an amazing group of women we are: intelligent, accomplished…and don’t forget gorgeous! Another exciting facet of the evening was the focus on sports. Before the reception, we attended a screening of the Fordson documentary, which focuses on a group of American high school footballers. It was a great film, looking at how a group of young Arab-Americans in Dearbon, Michigan, included their faith and family in their football regimen. The reception also included some wonderful guests: Kulsoom Abdullah and Ephraim Salam. Kulsoom rocketed to national attention through her fight to compete in weight-lifting contests while covering her hair and observing hijab. Not only can she press over 200 pounds, she also has her doctorate in engineering–she’s a regular renaissance woman! 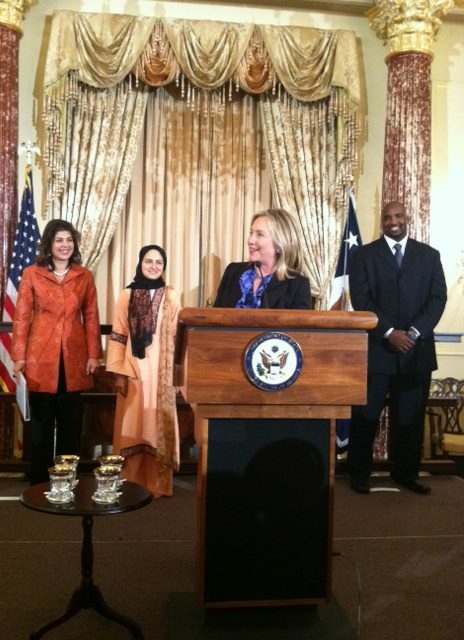 From left: Farah Pandith, Kulsoom Abdullah, Secretary Clinton, Ephraim Salaam. Photo by Souheila Al Jadda. This meeting was especially important because of several American Muslims, including myself, signed on to a declaration. It’s an affirmation of basic values and a core vision: we’re Americans, we’re Muslims, get used to it! Regardless of whether we were born in this nation or have recently adopted it as our home, we are committed to working with our fellow Americans to create a more perfect union for we, too, want a better life for ourselves, our children and our communities. In order to achieve these standards, we must all strive to understand and cherish the freedoms expressed in our Constitution and ensure none are denied these privileges. Check out the whole thing (along with a list of signatories) at The Huffington Post. Posted in Extras on September 12, 2011 by Fatemeh Fakhraie.